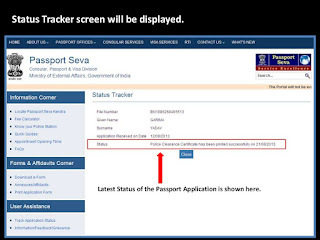 After applying for the there is some waiting time here because Indian government takes few days to complete passport processes so you have track passport status so there are many methods to check PNR status so we have gives all the way to check Indian passport status. STEP 2: Choose Application Type "Select Passport here"
Now passport applicants can get regular alerts and updates about the status of their application right on their mobile phones through SMS service. This is offered to passport applicants as an optional service with effect from November 16, 2013. An applicant needs to enroll for Passport Seva SMS service at the Passport Seva Kendra (PSK) or the Regional Passport Office (RPO) where he/she applies. The applicant will receive the progress status of his/her application, and alerts for pending actions through text messages. Also, the applicant can send a text message at any time to know the current status of his/her application. The enrolment of SMS service is optional. The one-time enrolment charge of Rs 30 is not included in the passport application fee. An applicant needs to select SMS Services while submitting an application, and he/she needs to pay the one-time enrolment fee at the PSK. An applicant can enroll for SMS service at the time of filling out the application form or uploading the electronic format of the online portal. In case an applicant has already submitted the application form online or has uploaded the electronic form, he/she can enroll for SMS services using Enrol for SMS Services link under Services section after login. An applicant can track the status of his/her passport application by sending an SMS to 9704100100 in the format STATUS, for example, STATUS GZ1060620484012. You will receive reply with your current passport status in response to the SMS. However, the passport status online is updated in real time and is the most popular way of tracking passport status among the applicants. The basic information you will need to check your passport status is: 15 digit alphanumeric code issued at the time of your application submission.